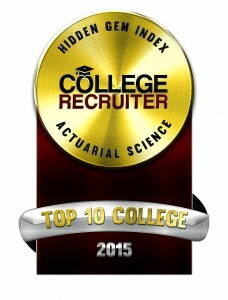 College Recruiter used its custom research product to generate this ranking. Our database includes 185 majors at virtually every one of the 4,000 one- and two-year colleges and 3,000 four-year colleges and universities in the United States. A custom labor market or salary research report can tell an employer, for example, what the going rate is for a recent graduate with a certain major at a specific school. Other common queries include data related to SAT scores, gender, ethnicity, as well as tenure and turnover of employees. The modeling for this hidden gem school project was to identify the schools which featured high SAT/ACT scores for entering students, high average starting salaries for the regions in which the schools were located, a high percentage of graduates working in their chosen field of study, and a majority of the graduating class available for recruitment by employers. The availability factor distinguishes many of the excellent from the hidden gem schools. An excellent school may have a high percentage of its graduating class already committed to work for other employers or going to graduate school but that is not a school at which most employers will find success in their effort to hire graduates. A hidden gem school, on the other hand, is one at which employers are likely to find high quality candidates who are ready, willing, and able to say yes to an offer of employment. College Recruiter (https://www.collegerecruiter.com) helps recent grads and students find great careers. College Recruiter is the leading niche job board for college and university grads searching for entry-level jobs and students searching for internships. Our site features hundreds of thousands of entry-level and internship job posting ads as well as tens of thousands of pages of employment-related articles, Ask the Experts questions and answers, blogs, videos, and more. Our clients are mostly federal government and Fortune 1,000 corporations who advertise their job openings using our job postings, targeted email campaigns, targeted mobile banner ads, targeted display ads, and virtual career fairs.